*Real old-timer Games Workshop fans may remember Carl as our top Greenskins Blood Bowl player in the Studio league back in the day. He even beat Jervis Johnson** in a battle report and had a tactics article published in White Dwarf. **Okay, so who hasn’t? But that isn’t my point. I can’t start casting aspersions with my record, can I? We’ve been having a great time devising a set of universal historical/ fantasy skirmish rules. The premise is, like the best ideas, simple. 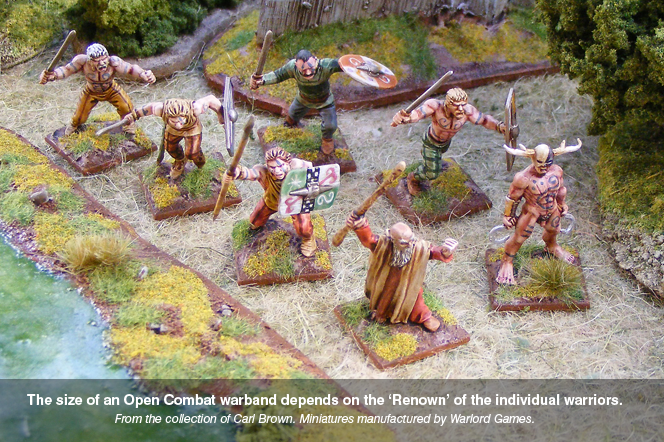 Open Combat is a scenario-based system that allows you to play pre-gunpowder historical or fantasy skirmishes with any of the models you own. 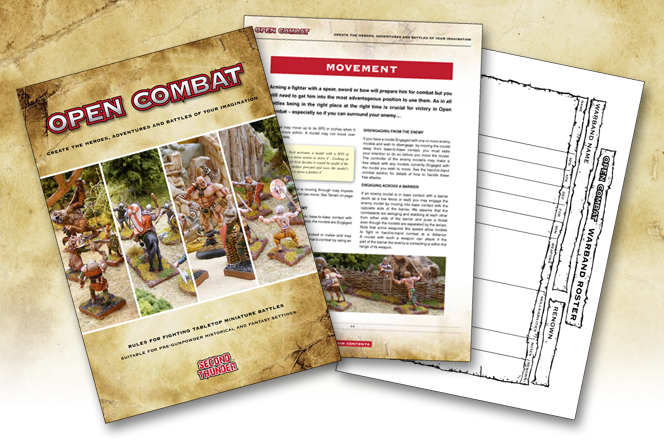 Carl has been busy talking to various miniatures manufacturers to use their lovely models in the book, but Open Combat is not tied to one specific range. This is made possible with a flexible force creation system, so that with just five simple stats, a choice of weapons and some skills you can put together the rules for any miniatures you have. 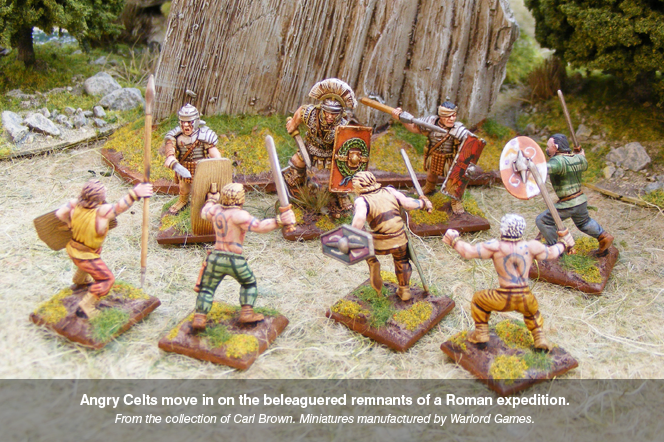 Want to recreate a Germanic warband trying to capture the eagle of a Roman Legion? Vikings pillaging a Saxon settlement? A cadre of elves protecting their forest home from a horde of goblins? What about that time a hill troll wandered into the heroes’ camp? All of this is possible, and it only takes a few minutes to get started. For both Carl and me it was important to get back to the ideas that brought us into gaming in the first place. Fast, narrative, imaginative play was our aim. When we were both nippers we didn’t bother with army lists – I remember barely bothering with rules at first. We wanted to get out our favourite miniatures and play. That is the essence of Open Combat. There are three key ingredients to recreating that approach in a proper set of rules. The first of these is accessibility. We are both keen that anybody who has some miniatures lying around can get started with the minimum of effort. You can conduct a game on your kitchen table if needed (most of the playtesting was done on my dining table, in an area no bigger than 24″x 24″) with a few pieces of terrain and a handful of models each. The second is scope. We don’t want players depending upon us as developers to release rules for the miniatures in their collection. While we have a whole bunch of extra modules and articles we’d like to work on, the warband creation system included in the main rules contains lots of options to personalise your gang, crew, warband, etc. How you choose to represent something in the game is entirely up to you – there are no ‘official’ stats at all. IN the same vein, it’s entirely up to you what size of game you want to play. Most of our games have ended up between about 5 and twenty models, but that’s just the way we approach the warband creation. The third was fun. I know this may sound a bit odd, but let me explain. Some wargames rules attempt to recreate a situation faithfully to every degree – the simulation wargames. Some are more about the gameplay. Good games should feel right but not get bogged down in detail, and we deliberately veered towards solutions that added to the fun and narrative of the games rather than realistic simulation. 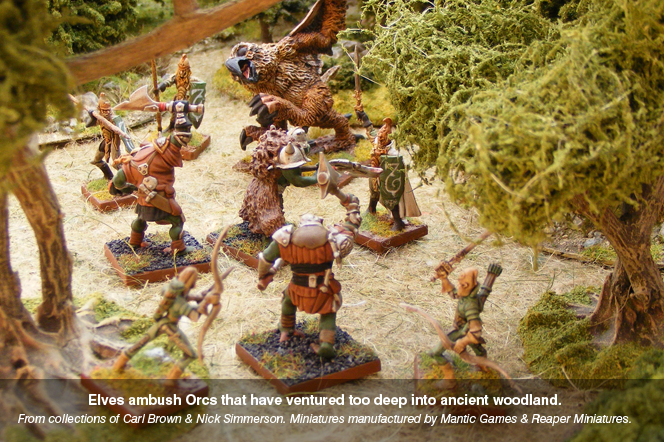 We wanted the players’ imaginations to be as an important component of the game as the miniatures and dice. All you need to play are the rules, some toy soldiers and three six-sided dice. We’re really happy with the result, but try out Open Combat yourself. For a launch price of just £7.50, less than most blister packs these days, it’s worth a punt, surely? You can follow what’s happening on Twitter – @second_thunder – or on the Second Thunder Facebook page and of course there will be regular updates on the Second Thunder website once that is fully up-and-running. There have been a couple of ‘first impressions’ posts already, so check out these articles on Meeples and Miniatures, and Proximacoal to see what they think. I’m off to twiddle with some rules I’ve been working on for Undead warbands, but my Normans and Saxons stand ready for battle at any time. That’s pretty cool – I love the idea of an open ruleset for skirmish. I’ll have to give it a shot. To be fair I had the conversations with the various miniatures companies in early 2013 – it’s taken that long for me to finish it! With the type of wargames I’m gravitating towards these days (quick to pick up and play, customisable) this looks right up my street. Perhaps its up yours. I picked up a copy and it looks very good, I am looking forward to giving it an outing and it is nice to see Heresy’s Boris on the cover. I think this will of interest to the Shell Case irregulars, so for those that haven’t seen it on my blog, here’s a brand new miniatures skirmish game.